You’re about to see the best college application resume on Earth. I didn’t get accepted by my first pick. So why should you listen to me about your high school resume for college? Because if I’d known what I know now, I’d have got into Harvard, Princeton, Hogwarts, or any school I wanted. If you can follow simple instructions, you can stand out like Emma Watson or Steph Curry. You can literally get into any school you want. A college application resume example better than 9 out of 10 others. How to write a resume for college to get admitted to the best schools. Tips and examples of how to put skills and achievements on college resumes so they shine. 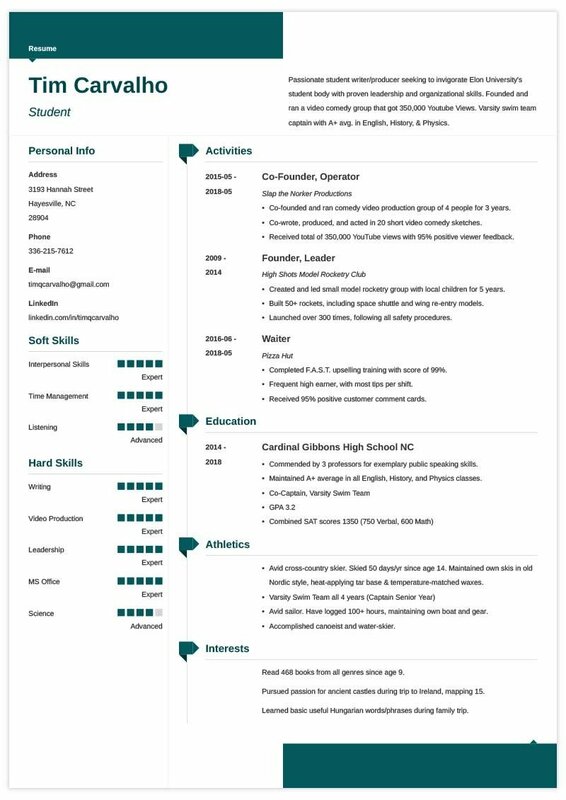 Here's a sample college application resume template made with our online resume builder tool. Now this is what a college resume should look like! Start with the reverse-chronological resume format. Why is that the best college resume format? Because colleges get a lot of applications. You need to show off your best stuff fast. The reverse-chronological layout does that. It puts your achievements in a pair of Jordan 10s. It makes you stand out like a bowl of Oreos amid a sea of Brussels sprouts. Use plenty of white space, big headings, and the best resume fonts. That’ll show your strengths fast. Looking for a college application resume template in Microsoft Word? Don’t. MS Word doc resumes can turn as thick as the Wall Street Journal in transit. How long should a college resume be? 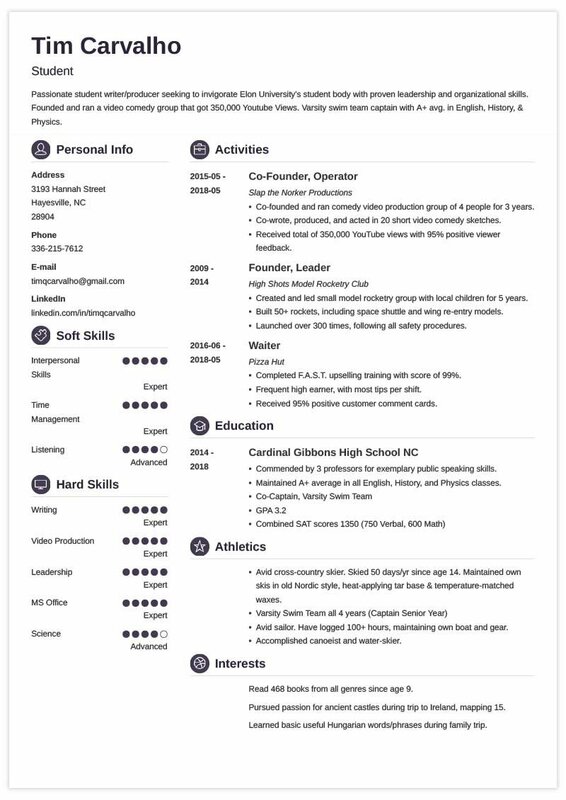 In general, a one-page resume is best for a high school resume for college applications. Pro Tip: PDFs are great, but make sure the admissions department doesn’t disqualify them. A few colleges won’t take college resume PDFs. Next, you’ll learn how to make a college resume ready for the big leagues! How does an admissions department read 30,000+ applications? If your resume objective is great, they read the rest. The good news? It’s not hard to write a great objective. Check out these two college admission resume objective examples. 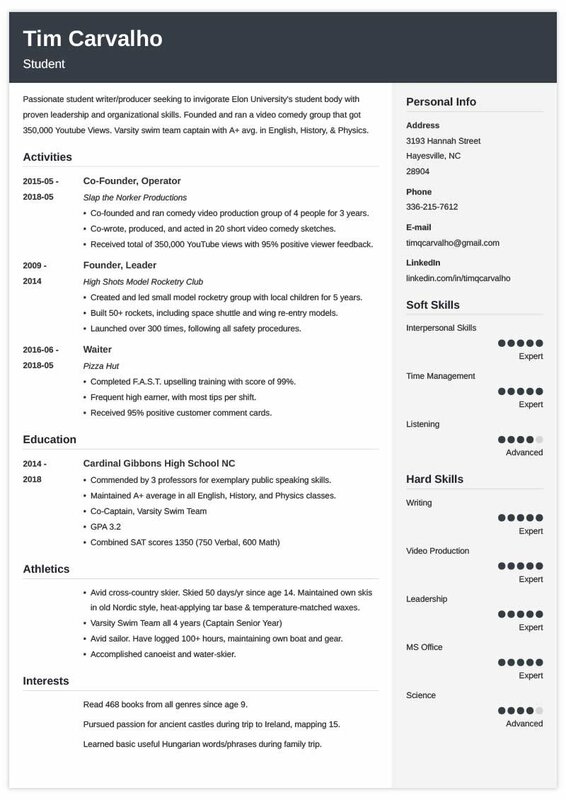 What’s wrong with the first of our college resume examples for high school seniors? Very hard-working student with a passion for math and science. I only have a 3.2 GPA and 1350 SAT scores, but I’m committed to working very, very hard in college. I was captain of my high school swim team. That’s not TMZ bad, but it won’t get you in to see the dean. Passionate student writer/producer seeking to invigorate Elon University's student body with proven leadership and organizational skills. Founded and ran a video comedy group that got 350,000 Youtube Views. Varsity swim team captain with A+ avg. in English, History, & Physics. Who’s that, a young Jim Gaffigan? Plus, it shows passion. Not by saying it. By showing it. But what if you don’t have achievements like that? What if you’re just mediocre? Oh, you’ve got them. Trust me—please trust me—you’ve got mind-blowing achievements. The secret? They’re invisible to you. Pro Tip: Can you attach a resume in The Common Application? Yes, Common App resumes can be attached in the “additional information” section. You can use our online resume maker as your very own college application resume builder. Just pick one of our templates (perfect for college applicants) and follow advice from this guide. That’s three. But there’s more where that came from! 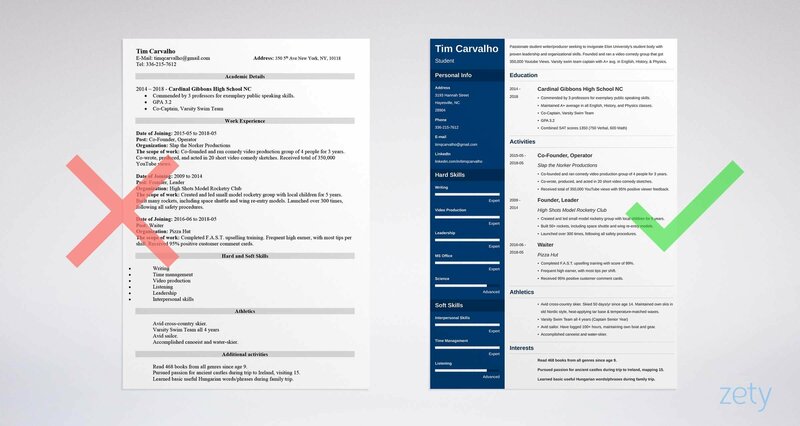 The Zety resume builder features 20 templates that make great college resumes. Simply pick a resume template and build a college resume here. Remember I said I didn’t get into my first-choice school? I wish I had a do-over. If I had a time machine, I’d use it to slap myself. Founded and ran model rocketry club at age 9 with 5 members for 5 years. Built and launched 50 rockets 300+ times. Avid cross-country skier, skiing 50 days a year since age 14. Maintained own skis in old Nordic style, heat-applying tar base and adding temperature-matched waxes. Pursued passion for ancient castles during trip to Ireland. Visited and mapped 15 specimens. Traveled to Hungary. Learned base of useful words and phrases by interacting with locals. Formed love of cold soups. Avid D&D player. Led troupe with 7+ members for 4 years, creating and producing several multi-month campaigns. Built video comedy group of four core writer/actors, making two 1-hour sketch-comedy specials. Disseminated them on video to audience of 100+ students with rave reviews. Pursued passion for history and physics, maintaining A+ scores in both. None of that was on my college application resume! I never did the head-scratching. I never thought about achievements. I don’t have a time machine. But I can save you from the same dumb move. Stop and think. I guarantee you’ve got achievements that make mine look like Carl Grimes. The college resume examples below show what to do. The first of our resume examples for students is on fleek. Co-founded and ran comedy video production group of 4 people for 3 years. Co-wrote, produced, and acted in 20 short video comedy sketches. Received total of 350,000 YouTube views with 95% positive viewer feedback. Avid cross-country skier. Skied 50 days/yr since age 14. Maintained own skis in old Nordic style, heat-applying tar base & temperature-matched waxes. Read 468 books from all genres since age 9. Pursued passion for ancient castles during trip to Ireland, mapping 15. That’s lit. The admissions officer who’d pass that up must get his news from Yahoo! Notice the details that measure all those wins. Don’t just list every achievement at random. Focus on the ones that match the school. 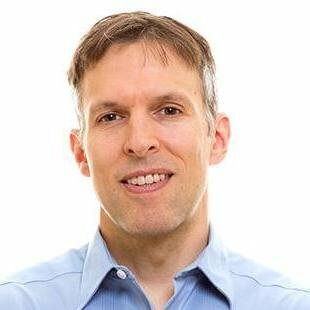 For instance, are you applying to a top computer science school? Show CS achievements first on your high school resume for college. Trying to get into Harvard Business School? Your college resume should highlight leadership accomplishments. Basic. That sample resume for college application will barely make it through the door. So, take the time to look into your past. What have you achieved? Pro Tip: Take an hour and a sheet of paper and really do this brainstorming work. Don’t make a college interview resume like the rest. Make one that stands out like Hazel Grace Lancaster in a mortarboard. What do you put on a college resume? When I was a kid, and admissions officer from a big college spoke to my class. I thought he meant that I should say how great I am. He literally meant I didn’t know how. You don’t do it by using strong adjectives like enthusiastic, hard-working, or, driven. You need to pick the right details. Awards. List competitions (essay, speaking, spelling, storytelling, art) or even perfect attendance. Jobs. Did you wait tables? Wash dishes? Use part time or summer jobs to show your work ethic. Volunteer Work. Bake sales, GoFundMe projects, hours logged at Goodwill or the local hospital, or other work you did for free. Social Media Followings. YouTube, Facebook, Twitter, Instagram. Have you built up an impressive following? Show it! Projects. Websites built, art portfolios or shows, or public service projects. Anything you put your heart into can look good on a high school resume for college. Sports. List varsity teams or captainships. Show track, football, LaCrosse, powerlifting, swimming, soccer, baseball or any other sport. Passions. Have you read a lot of books? Do you make models? Are you a teen guitar hero who played at two school dances? Passions look great on college resumes. Hobbies. Do you collect anything? Make anything? Hobbies prove you use your time productively. Leadership Positions. Are you an Eagle Scout? 4-H member? Active in your church? Official or unofficial clubs or groups can bolster college resumes. Languages. If you’re fluent in French, Spanish, or German, or even if you know a little, show it. Pro Tip: Use details. Don’t just say, Eagle Scout. Say, Eagle Scout with 200+ hours of community service. For Eagle Project, raised $3,000 for the homeless. Does education matter on a college resume? Let me show you what I mean with two college application resume examples. Both these high school student resume examples for college target the same business school. Commended by 3 professors for exemplary public speaking skills. Maintained A+ average in all English and Math classes. That’s not some basic applicant. It’s Moziah Bridges or Millie Bobbie Brown. It shows leadership, communication skills, and a strong work ethic. Bland. The admissions officer will dodge a college resume sample like that. Pro Tip: Should you put junior high on a college app resume? Only to show impressive achievements or an improvement in your grades. You made it this far. You’ve got a good start on your college resume objective, activities, and education. But, as a college applicant, do you need work experience on resumes for college applications? Look at these two sample resume for college application experience sections. Completed F.A.S.T. upselling training with score of 99%. Frequent high earner, with most tips per shift. Received 95% positive customer comment cards. It doesn’t only show you had a job. It shows qualities that matter to admissions officers, like work ethic and interpersonal skills. Responsible for waiting on tables in a busy restaurant. Trained as cook to fill in during busy times. Able to work cash register when needed. Well, hello, Jesse Pinkman. That works if you’re applying to another waiter job instead of college. A good college resume for high school students needs relevant achievements. Pro Tip: Add only 3–5 bullet points to a college admission resume education section. Got more? List them as activities or interests. You have exactly what it takes to succeed in college. First, know what skills admissions officers value. Next, don’t just list them. Prove them on your college resume. Let’s say you’re applying to a business school that values leadership and literacy. So, prove it in your bullet points. Created and led small model rocketry group with local children for 5 years. Built 50+ rockets, including space shuttle and wing re-entry models. Launched over 300 times, following all safety procedures. Learned basic useful Hungarian words/phrases during family trip. Do that, and you’ll be your first pick’s first pick. Couldn’t you still be lying? You could. If you are, they’ll catch you in the interview. Need some college resume skills to start with? This list makes great resume keywords too. It’s not comprehensive, so look for others in your past and online. Follow the plan above and your high school resume for college will look like Selena Gomez wrote it. Pro Tip: Don’t just use skills from our list. Think what skills fit the school best. A customized college resume will beat a generic option any day. Do you need to send a cover letter with your college resume? Yep. Even if the admission office says cover letter optional. But don’t worry. It’s painless and powerful. First, make it personal by using the dean’s name. Next, say why this school is so important to you. Then, show what you have to offer. I'd welcome the opportunity to discuss how I can enrich the student body at Elon University. Pro Tip: Always follow up on a college application resume and cover letter. An email or letter in a week or two works best. Note: “professional” means no ColdPlayFan38498@yahoo.com. Use john.doe@gmail.com instead. Don't forget to add a LinkedIn profile or a personal website if you’ve got one. Either can show the dean you’re more than just an application. Pro Tip: If you’re reading this and don’t have a LinkedIn profile it’s not too late. Just use our guide to LinkedIn magic here. Put on your thinking cap. You have tons of flashy achievements for a resume for college applications. You just need to do the thinking time. Customize your college application resume. Your experience and education bullet points should prove you’ve got the skills to make it through. Write your college resume objective last. Stuff it with your best achievements to make the admissions officer stop resting his eyes. Make a cover letter. College admission resumes with cover letters have a higher chance of moving up the food chain. Do you have questions on how to make a great resume for college? Not sure how to describe your skills or achievements? Give us a shout in the comments! Let's get you in your dream school!